On Sunday we rode the tandem from London to Brighton (again) along with about 27,000 other cyclists to raise money for the British Heart Foundation. We had a bit of an outfit crisis as the weather forecast kept changing its mind so we decided to play it safe and wear 1787959 layers. It turned out to be a beautiful sunny day and our waterproofs ended up just being extra weight to carry, which was just fine. It was lovely to meet so many other tandems and compare how many times people had said to them 'They aren't peddling on the back'. 23 said it to us. We'd like to say a special thank you to everyone who cheered us up Ditchling Beacon. Especially the tandem guys in the frog and squirrel onesies who cheered extra loud. 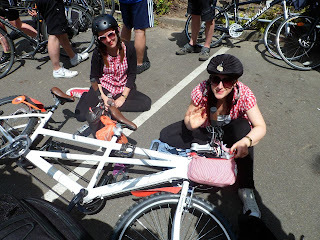 If two girls on an off road tandem without padded shorts and special shoes can do it, anyone can. See you all next year. Insanely early for a Sunday morning. Do you like my turbanised helmet? He likes to do it for Madonna. Lairy Fairies. We like to hold hands and ride with other tandems and see who chickens out first. They did. At the half-way mark where we left the fairies having a pint. This grey cloud was not invited. Ok, denim jacket off, hair up, let's nail Ditchling Beacon. Bouncy bronco morph guys. Made me seasick just watching them. I like to match my outfits to finish lines. Now who wants to give us and our massive tandem a lift back to London?